"These are tangy and sweet and VERY addicting. The recipe doubles well." Sift the flour with baking powder and salt. Set aside. Beat egg and add sugar slowly. Blend in 1 tablespoon butter or margarine. Stir in dates and nuts. Gradually add flour mixture, mixing well. Pour into a greased 8x8 inch pan, spreading evenly. Bake at 325 degrees F (165 degrees C) for 25-30 minutes. Cool in pan on wire rack. 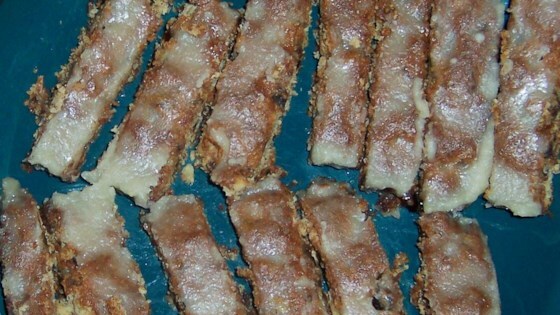 Spread top with glaze and cut into 24 sticks. To Make Glaze: Combine 1 tablespoon milk, 1 tablespoon margarine, 1 cup confectioners' sugar, 1 teaspoon lemon juice, and 1/2 teaspoon grated lemon rind. Heat over low heat until well blended. Cool slightly before pouring over cookies. These are wonderful and easy to make. They are very sweet and addictive. I used a 9X9 pan and cut them into 36 little square pieces. Thank you for the recipe. These were gone in a flash! I don't love dates, so I wasn't sure I'd like these, but they were so good that we couldn't stop eating them! Just drizzle the glaze over the bars because it's too sweet.